For many years, I have been accredited by our Courts as a Family Law Mediator to mediate all aspects of a parties’ divorce, as well as post-divorce issues. I have served for over two (2) decades and am listed in both the Bergen and Passaic Counties rosters of economic mediators, such that a case that is in litigation and not resolving, may be sent to me as Mediator in an attempt to resolve the case. I have both the experience and unique perspective of getting to the bottom line of the issues preventing settlement. I do private mediation for the parties as well. The parties can choose mediation at any time, either before, during or after the divorce process has begun. This will be explained further below. First, why consider mediation to begin with? Mediation can save the parties considerable time, money, and aggravation. When a case is litigated, it is proceeding through the court system, which is usually a lengthy, complicated and expensive proposition. When the case is in the court system, the Court controls the process. The parties have to appear for certain hearings as determined by the Court, with the consequence of additional court and attorneys’ fees, time and aggravation. In mediation, the parties choose the dates and times when they would like to meet and how to proceed. 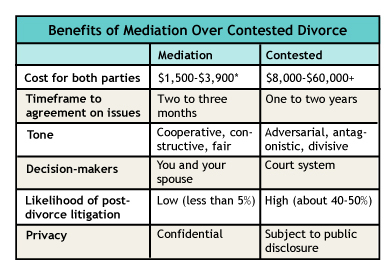 Mediation also allows the parties to determine the outcome of their issues, whether they involve distribution of assets, alimony, child support, custody, parenting time, or other issue. Mediation provides the parties an opportunity for enhanced communication and a more cooperative relationship now and in the future, especially if the parties have children together. Mediation makes the parties more committed to arrive at an amiable agreement. Mediation utilizes the principle of “Fundamental Fairness”, thus maximizing the benefits for everyone. It is a more streamlined, efficient and less costly approach. Mediation provides a forum where issues in controversy are narrowed cutting time and expense. Mediation provides more privacy with regard to the parties’ finances and other issues that arise as part of any divorce case. The “airing out” of the issues remains in house with the parties rather than in a public courtroom. 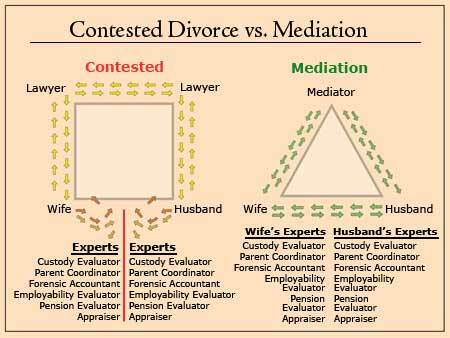 Divorce Mediation…This graphic clearly depicts why mediation is faster, less stressful, and more affordable than contested divorce. In a typical divorce, spouses don’t talk directly with each other, leaving their lawyers to negotiate for them. Mediation breaks down this serious communication barrier and sets the tone for cooperation. With the guidance of a capable mediator, spouses actively work together to reach a fair agreement on the essential issues of support, assets, and parenting. Starting from areas of agreement to establish a foundation then addressing areas of controversy. Providing relevant information and examples from experience as needed. Averting misunderstandings and clarifying intentions. Helping you see your spouse’s perspective without losing sight of your own position. Call 201-431-8400 to schedule your FREE New Jersey divorce, divorce mediation or collaborative law introductory consultation. Philip C. Puglisi LLC is a Bergen County, Passaic County and Essex County NJ Divorce Attorney law firm. The family law firm concentrates on: Collaborative Divorce Attorney Services and Divorce Mediation Services by an experienced Divorce Mediator with family law offices in Wyckoff, New Jersey. As I stated, mediation can begin either before, during, or after the parties’ divorce and either with or without attorneys involved. Some couples seek consultation with me as a Family Law Mediator just to learn what is involved in the mediation process before either or both retain counsel. Usually the spouses at this point are amicable and are committed to working through their issues to arrive at a Marital Settlement Agreement (MSA). If they decide they want to proceed with the mediation process, I explain what is involved, my role, show the parties our retainer agreement, and explain the costs involved and the approximate time the process might take. One common misconception is that a mediator will be advising either or both parties on what to do or what the law is. This is not the case at all and is not permitted. The roll of the mediator is to facilitate a resolution, not to give legal advice. The mediator is neutral. Thus, the parties are free to retain their own counsel during the mediation process for guidance and advice along the way. For example, let’s say the parties agree to sell the marital residence, but one party wants to retain 20% more of the net proceeds than the other party. After the mediation session, (or at the end of all the sessions), the parties would discuss this issues with his/her lawyer and get advice. There are no requirements to have a lawyer present during the mediation process. It is the choice of each party; but it is the better way to go. I often represent a spouse who is involved in mediation elsewhere, but consults with me periodically during the mediation process for advice. The end goal of the mediation process is for the mediator to draft up what is called a “Memorandum of Understanding”, which is essentially an outline of the issues that appear to have been resolved by the parties. Each party than takes the Memorandum of Understanding to his or her attorney for review and comment. If acceptable, one of the party’s attorneys’ will draft a formal Marital Settlement Agreement (MSA). 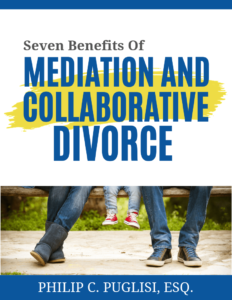 If the parties already have counsel before the start of the mediation process, and the divorce has already been filed, mediation can be helpful, essentially proceeding in the same fashion as above. Family Court Judges are happy to hear the parties are in mediation. Mediation helps relieve the Court of the burden, and parties the expense, of proceeding through the Courts. When completed, and if settled, the Court would be so advised, and the matter would be put through as an Uncontested Divorce. Mediation can also be used after divorce as to issues that develop. Perhaps there is an issue regarding modification of alimony or child support, or an issue involving payment of college expenses. This can all be handled through mediation. The bottom line is that through mediation, I do all I can to move the parties expeditiously and productively towards a mutually agreeable resolution.